Green Guide Tours is offering the 1st Bud Crawl™ in California! 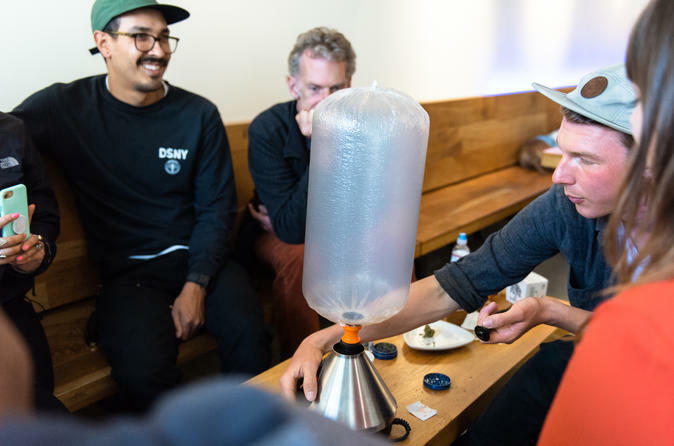 Similar to a Pub Crawl, guests enjoy an enlightening walking tour of some of our favorite dispensaries in San Francisco. Visit 3 dispensaries and 2 state-of-the-art lounges where you can enjoy cannabis from the best dispensaries in the city. Learn about the science, history, agriculture, and booming industry of legal recreational cannabis use. Green Guide Tours DOES NOT provide cannabis for guests. MUST BE 21+ YEARS OLD. STATE ID OR PASSPORT IS REQUIRED. Starting at Yerba Buena Gardens in front of the Martin Luther King Jr. memorial fountain at 11:30 am, we discuss the history of dispensaries and the future of cannabis retail. Our first stop is (what we describe as) the friendly neighborhood dispensary, where we review the 101 basics of cannabis before guests make any purchases. We also compare and contrast the differences in cannabis menus and how they have evolved over many years. Enjoy affordable products while interacting with friendly, energetic staff at the bud and hash bars. After our first stop, we'll take a short stroll through downtown San Francisco to our next dispensary, which we refer to as the "sophisticated steakhouse." Meet well-informed bud-tenders as they walk you through their menu of high-end products. After purchasing, guests can enjoy the state-of-the-art smoking lounge as we discuss the science and cultivation of this magical plant! This tour ends at the compassionate boutique dispensary, where we discuss the future of the industry. Here you'll be able to purchase quality products and use the best vaporizers available. Learn what direction the industry is heading in and who is benefiting most from the "green rush." Before you depart, you'll get the best food & beverage recommendations from your local guide. Our goal is to help de-stigmatize cannabis through fun educational experiences. Our Bud Crawl is the best introduction to cannabis for everyone, from beginners to experts, who wants to nerd out on the science and future of the industry. Each tour group is limited to 12 people, so make sure to book your reservation today!